eat, drink & be vegan: Vegan Dessert... Quick! Here's an idea for a very quick, very easy vegan dessert, great for potlucks or other get togethers where you want to bring a sweet. 1. Dark chocolate cups. I used miniature cups from Botticelli, purchased from my local grocery store! Larger cups are also available. 3. One packet of Mori-Nu Pudding Mates Mix, any flavor. I prefer the vanilla mix for these cups, but you can use whichever flavor you like. 4. Fresh fruit of choice to top the cups (ex: sliced kiwi, strawberries, fresh blueberries, raspberries) or some chopped toasted nuts (ex: almonds, hazelnuts) and dusting of cocoa powder if you like! I like the Mori-Nu pudding mix here because it makes a thick, creamy pudding. Some non-dairy puddings and mixes are a tad runny and thin. 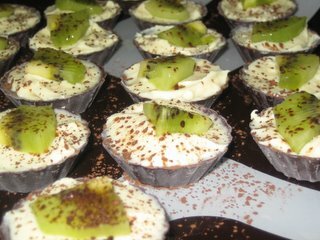 You can also fill these dessert cups with other things, like fresh fruit on its own, tofu cream cheese mixtures, chocolate "mousse", etc. Try these out sometime... hope you enjoy! Wow, those look so, so good! 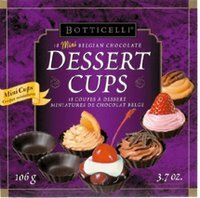 I've never seen chocolate dessert cups like that before -- it's love at first sight!! Are they sold frozen? Do you keep the cups frozen or refrigerated after you fill them? Great idea! I think that I saw those dessert cups a couple of months ago, but I didn't even think to check to see if they were vegan. Wow, Dreena, did you discover the MacroMode or what?!? These cups are wonderful and look so good. What an idea and better yet, NO OVEN!!! Thanks for this wonderful idea, as I make chocolate mousse, similiar recipe, but I don't use a "mix". Same steps though and I love the idea of chocolate cups. I'd like some right now please. Oh, and you are so right-on with the kiwi. mmm. These are really cute! I don't know if I've ever seen that pudding mix, though. Thank you for all the links! I will check them out! I haven't even SEEN vegan pudding! ZOINKS! I posted a dish I made last night...it was alright...I think it was missing something though! I got your books today!!! I was thumbing thru it and wondered if you would be able to post a pic of the Hummus-Quinoa Casserole on your blog - that recipe looked awesome! I will have more time later to go thru them...can't wait to try one. Julie... there's pudding mixes at Sunflower Market, Whole Foods and I think one kind at the co-op. I for sure know they have them at WF's. Thanks, Leslie--I was thinking about using your puding mix~! Oh, goodness. I need to find those Mori-Nu Pudding Mates. I always seem to have a box of the stuff lying around. I've never seen those chocolate cups before, but they look so nice. Thanks, Jennifer! They are not frozen or refrigerated, just stocked on the shelves... I am trying to recall where our grocery store put them - I think it was past some of the specialty/ethnic items, rather than in the baking/chocolate aisle. They're great because you can pick them up at anytime and just keep them in your cupboard until you need them! Thanks, Danielle. I picked up another brand name as well once, but they were through a local grocery store and the brand was 'Western Family'. There may be other brands out there in your area too. That's interesting Julie, because our grocery stores (not just health food stores) always stock this pudding mix but it doesn't seem to be that well known... hmmm... odd. Hi Sarchan, yeah, they are pretty good. Depending on what flavor you like best. Chocolate is quite good too, but I like the vanilla flavor in these chocolate cups. I have tried other pudding mixes and they sometimes lose their texture after a night in the fridge and get runny. These always stay thick. Good luck finding them! Cute! A food processor is on the top of my kitchen appliances to purchase list. My smoothie/blender does not cut it. at all. I think I've seen something like those cups in Whole Foods. That sounds really neat. THESE LOOK SO GOOD. I have been having some real difficulties lately with finding vegan chocolate at the regular store. Last weekend my new food processor arrived from Amazon.com (was cheapest there) I LOVE it!! I'm not sure how i survived so long with out one! I got a KitchenAid 7 cup processor. It is really quiet too! Thanks for the suggestions on my dish! One question...what is hoisin sauce? I also made Hummus with Jalapenos and Cumin and Nutritional Yeast and another Hummus with Red Peppers and extra garlic. Do you think this is really weird...I was thinking of watering down the Red Pepper and Garlic Hummus a little more and putting it over pasta. It was sweeter and reminded me of a creamy sauce almost - thought it might be good over pasta...what do you think? Hi Patty, that's a shame that you aren't finding vegan chocolate. No Endangered Species or Tropical Source, or even Lindt? Maybe I'll do an entry someday soon to cover some vegan chocolate options out there. Hi Madelyn! You can get them at Save-On (and they have also had the Western Family equivalent too). I would suspect that Safeway also carries them, but I barely ever shop there. I just posted about the Hummus after you left and linked you again. I can't find Vegan Chocolate either! I can find only one kind of Endangered Species vegan chocolate but only in single bars and it's at a place that is over an hour away! Thanks for the info on that sauce I am going to ask the lady at the herb store if she can get it because our grocery stores don't have much for asian items...and the herb lady is so great! She has been getting me Tahini, various teas, Nutritional Yeast, Chives, and other spices, Almond Milk, Agave Nectar, various breads and bagels, and much more. She's great! And she's close to where I work so I visit them about 2 to 3 times a week for one thing or another. Thanks for the tips! You're a peach! I made some pudding for the munchkins today but had to pass on the dessert cups. They have them at our local Whole Foods, so hurray for that. One of these days I will be nicer to my family and make these! You're welcome, Harmonia, no problem. I was at a party last night, and a guest had made these, they were WONDERFUL! (I'm making them for my party tonight!!!) Thank you!! !